American YouTuber Logan Paul’s January trip to Japan demonstrated everything not to do when filming a video in Tokyo. Paul made international headlines in the first week of 2018 after posting a video of what appeared to be a dead body in a forest near Mount Fuji infamous for suicides. While media around the world chided the YouTube celebrity for uploading the clip featuring the graphic footage and showing him making jokes about it with friends, it wasn’t long before people discovered other videos Paul had created in Japan’s capital. Much disrespect to Tokyo: Logan Paul drops his pants on the streets on his recent trip to the capital. The block-headed YouTuber’s videos, however, sit at the extreme edge of the spectrum of bad clips made by people visiting Japan. Paul’s entire shtick is to be an over-the-top personality, with his volume and personality cranked up to the max. As obnoxious as his Tokyo antics were, they were also rather obvious in their stupidity (and not new from a guy who has pulled similar stunts in Italy and the U.S.). Most people probably don’t need to be told that tossing Pokemon plush toys at confused restaurant staff is embarrassing in any country. Paul’s a chump, but one locked in a Sisyphean life of being grating in order to court viewers. He’s an outlier — both in terms of content and monetary gain — within the world of YouTube. Yet you don’t have to pull Paul-size blunders to annoy residents of Tokyo while filming. Many people who come to Japan and create content for the internet are guilty of much smaller, easy-to-forget mistakes that can irritate those around them. As tourism to the country continues to climb, more visitors will come with cameras and small-scale mics to document their trip for YouTube. This applies equally to newcomers settling in the country, who might create clips simply to share their life with friends and family back home — or possibly because they dream of viral success. “From my experiences, filming in Japan is far easier than filming in most countries, as people here seem to be sympathetic to filmmakers or photographers,” Chris Broad, founder of the YouTube channel Abroad in Japan, tells The Japan Times. What started as a way to keep in touch with those back in his native England grew into a 720,000-strong-subscriber spot focused on life in Japan. And his videos are model examples on how to approach filming, with Broad noting that no one has ever gotten angry at him while gathering footage. Both YouTubers, however, believe video creators shouldn’t have to avoid specific places. A point that popped up in a handful of Western articles regarding Paul’s Japan trip was his visit to the Buddhist temple Sensoji, with many criticizing him for filming in a sacred place. That said, Broad believes there is one place in Japan to avoid whipping out the camera. Kim Dao, who has operated a channel devoted to everyday lifestyle vlogs since 2011, says professionalism helps on this front — and can have long-term benefits. “Over the years, I felt that striking a conversation with staff members makes a huge difference,” she says. “I would start off giving them my business card, explaining what I do and why I’m filming videos. That generally leads me on to asking them if I can film in their store — 95 percent of the time the answer is yes. “If you do that, not only will you have much better footage, but I have had stores inviting me back to film at because I have helped increase their customers,” Dao says. This would suggest that a bigger issue than where you choose to shoot is how you approach the people who end up in the frame. Aoki’s YouTube uploads rely heavily on man-on-the-street interviews, and he says he’s aware many can simply be miffed by a stranger coming up to them with random questions. His strategy: Simply be as friendly as possible. And that’s important, because permission is critical. Obscuring faces could also potentially prevent your video from being removed. According to YouTube’s privacy guidelines, someone can file a complaint against a video if they can be “uniquely identifiable by image, voice, full name, social security number, bank account number or contact information.” While YouTube writes that a first name or “fleeting image” probably wouldn’t result in video removal, the site itself ultimately has final say on what gets taken down or not. And even if you ask for permission from someone to be in your video, that might not be enough. So be extra sure the people you film are OK with it. “Being loud and rowdy in public is also something you should avoid as it just causes others to feel annoyed,” Dao says. A representative at YouTube pointed to their Policies and Safety page, which outlines specific issues that could get a video flagged. Among the issues that might be most pertinent to filming in Japan (or any other country one isn’t from) are hateful, harmful and dangerous content. The latter, in particular, would appear relevant to the Paul furor, considering that a large number of his viewers are young and thus could be susceptible to imitating his behavior. 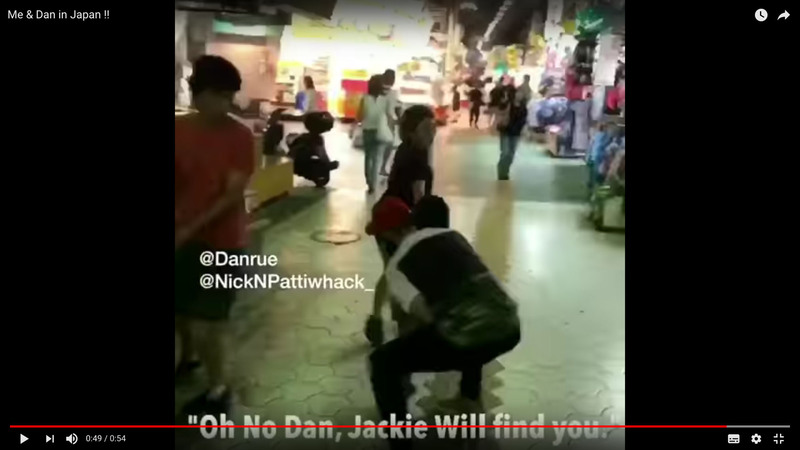 Moment of terror: In a video posted on the Nick & Dan YouTube channel, Dan Rue grabs a random child from her mother on an unidentified street in Japan. Paul’s trip to Tokyo featured a variety of cringeworthy moments unique in their dumbness, but uniting them all was a total disregard for others’ personal space. It’s telling that other noteworthy YouTube clips highlighting how not to film in Japan carry a similar theme. Last year, YouTubers Nick Joseph and Dan Rue uploaded a video of themselves running through the streets screaming gibberish in the style of a racist Asian caricature before pretending to kidnap a child. Before that one, Leela Rose caused controversy with a video that found her roaming the streets of Roppongi kissing men without warning — assaults that she sought to justify via a bewildering theory arguing that this would actually combat Western stereotypes. Every instance of a Japanese YouTuber doing something objectionable — for example, a 2016 case of one going into a convenience store and poking the shop’s vat of oden — was done by an individual who was unknown before their transgression. So what’s the bottom line when it comes to making videos in Japan? 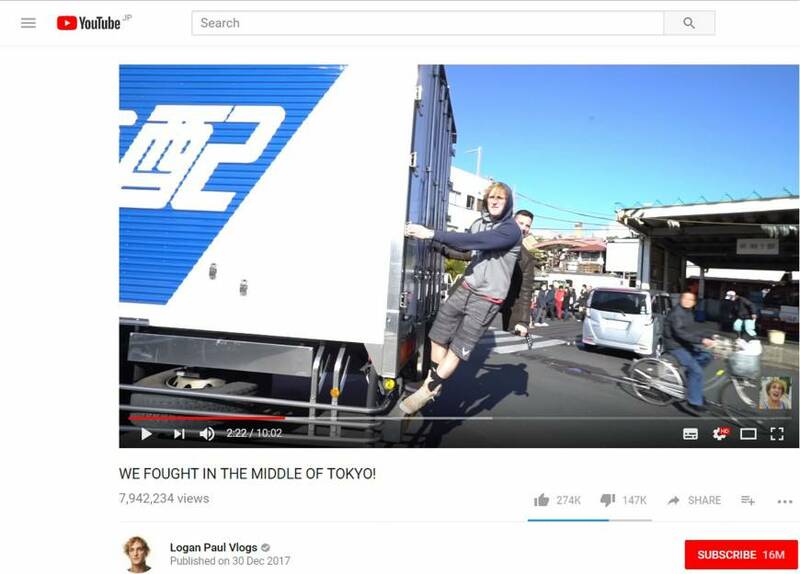 No ticket to ride: Logan Paul gets an unauthorized lift from a delivery truck in Tokyo in a clip from one of his YouTube videos. Broad hopes the Paul videos serve as a wake-up call rather than a call to arms for his fanboys. Yet the final issue boiling underneath the Paul incident concerns respect and representation. While Paul’s bone-headed physical actions got most media attention, just as unnerving was how he represented the country. And this might be the issue that pops up the most in video content about Japan, not just from YouTubers but also from Western media outlets and other personalities. 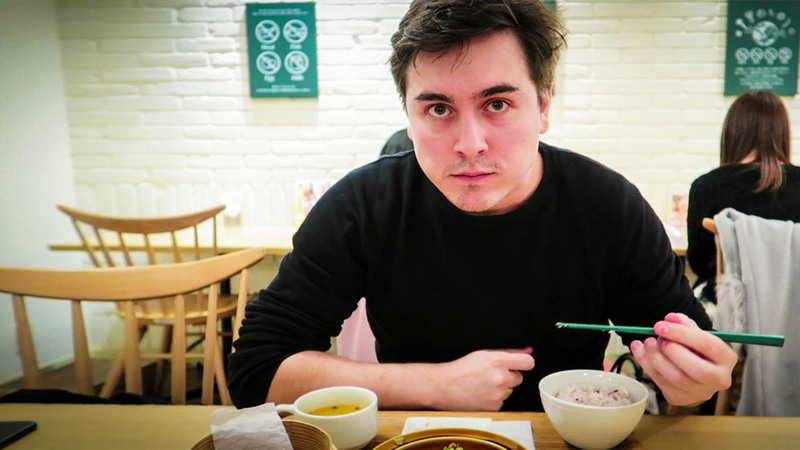 Broad believes YouTubers — both those based here and just visiting — should take time to actually get to know the Japanese people around them, and if possible get out of Tokyo, which can offer a distorted image of the country as a whole. He notes how he even now takes friends who visit him to meet people he’s befriended while living here, and he’s interested in filming places and people who usually don’t get the online shine.